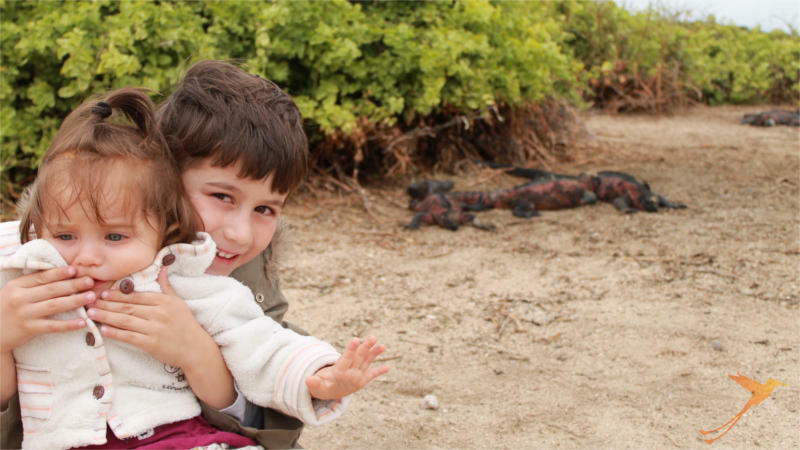 Ecuador and the Galapagos with Kids? A tour to Ecuador and the Galapagos with kids is quite a big thing when you come from Germany, considering that the international flight takes about 15 hours. As our kids, 4 years and 10 months old, are quite easy, we thought we might try it and we were definitely not disappointed! We visited Quito, the beautiful capital with its World Heritage colonial city center and great parks for the children to play in. The children loved the cloud forest and Nico, our oldest, was fascinated by the many butterflies that he learned to feed with pieces of banana. Tamia, our baby daughter, loved to sit in the hot thermal baths of Papallacta and didn’t complain too much, when we had to put a life jacket on her to get to our Amazon Lodge by canoe. The lush green landscape of the rain forest with its many interesting big and small inhabitants was extremely relaxing to look at from a hammock on the balcony. Nico learned to use binoculars and after a short time he could distinguish the bright blue tanagers and black and yellow caciques. The absolute highlight, however, was our trip to the Galapagos Islands. If you’re wondering whether a tour to the Galapagos with kids is a good idea, I can only advise you to try it yourself! Nico was extremely excited when we arrived at San Cristobal airport and could not wait to start looking for animals. As he had seen pictures in a book on the Galapagos Islands, he knew that there would be sea lions, pelicans, frigate birds, iguanas, blue footed boobies and many more animals for him to discover. We started our time on the islands at the Hotel Opuntia right on the malecon (waterfront) of Puerto Baquerizo Moreno. Even just walking down the malecon, we saw many sea lions, bright red sally lightfoot crabs, marine iguanas, a brown pelican and our first blue footed booby! In the water there were lots of fish. The sea lions were the kings of the malecon, lying everywhere and sometimes chasing people to the other side of the pedestrian walk as their roar is quite scary and loud. This was always very much appreciated by Nico, who loved to see the people jump at the sea lions’ roar, when they came too close to one of them relaxing right across the pedestrian walk. Nico himself was very careful not to come closer to the sea lions than the allowed distance of 6.5 ft. (2 m). He had more reasons than anybody, as many sea lions were huge and easily as tall as Nico himself. Tamia especially enjoyed the soft sand and the pleasant climate. Our land-based part of the trip was a good introduction to the Galapagos Islands, but when we boarded the cruise ship “Santa Cruz” an even bigger adventure was about to start. In short, everybody was just fascinated by the sheer amount of animals of all sorts expecting us on the islands of San Cristobal, Española, Santa Fe and South Plazas. It took a long time to walk the trails, as we were stopping all the time to observe large groups of lizards, blue footed boobies showing us their mating ritual or even taking care of an egg laid on the ground in the middle of the trail. Nico loved the fluffy, huge, grey and not very pretty Albatross chick that didn’t look at all like his elegant, beautiful parents. So, Galapagos with kids? I can only recommend it and I am sure your children will appreciate it, if you let them experience one of the most amazing encounters with nature this planet has to offer. The animals show no sign of fear and one has the feeling that it is really them who decide who may enter into their world! The giant tortoises were the ultimate highlight of our trip and I am sure that Nico will never forget the impressions he got there. A tour to the Galapagos with kids will truly be an unforgettable experience for the whole family. However, in our case we will have to come back some time in order for Tamia to also remember the tour. Definitely something to look forward to for the whole family! We have compiled some practical information on traveling to Ecuador and the Galapagos with kids – check out our Galapagos for Kids Tour and our Ecuador for Kids Tour.